We had a fun time as a family for Halloween. 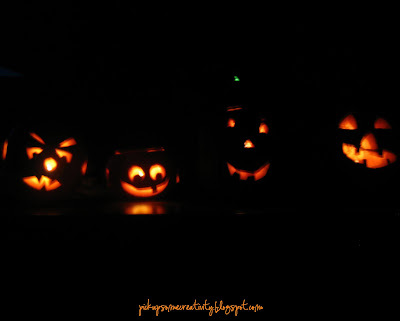 We had a bumper crop of pumpkins, and so each child got their own jack-o-lantern this year. They each designed their own (except Baby), and the older children just about carved their own by themselves. It was fun to see what they came up with. Little Boy used a press to make freckles and hair on his jack. 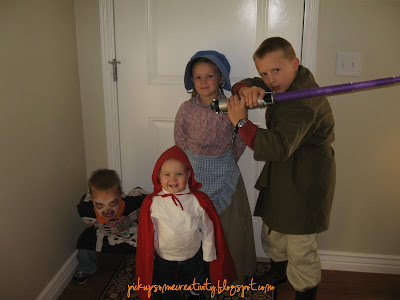 The skeleton costume was passed down from when my brother was little, Red was Big Sister's cape I made 5 years ago, Kirsten was the most work this year, which I've chronicled here already...and Jedi is on his third Halloween. I found a quick and easy robe pattern, and used this funky army type fabric I found at WalMart. Because we live in a rural area, our neighborhood had a "trunk or treat" party on Friday. It's a parent's dream...all the cars parked in the local church parking lot, people you know (so no worrying about x-raying the candy) easy walking on a cold night, you're done quickly, and can get home and enjoy the loot. Oh, by the way, the jello worms were a big hit. Sorry I didn't get a photo of the finished product. I was in a hurry to get the little ones dropped off and to the party in time. I've finished one of the Thanksgiving countdown calendars, and will post photos tomorrow. They're all adorable Chris! Do you have a pattern for Little Red? Can you believe AG is retiring Kirsten?! We are really bummed. The Little Red costume was created by copying a hood from a sweatshirt, then just adding about a yard of fabric in width (adjusting for length) and adding a pretty fat hem. That's the short version...it's been 5 years since I made it!